Ever since I was a child, I’ve always had a strong fascination to comics. They allowed me to escape into the world of alternate realities which the made duller moments of childhood such as waiting for my mom to buy groceries or brushing my teeth infinitely more interesting. However, it was Calvin and Hobbes which I was the most engrossed by, in contrast to the caped crusaders and superheroes like Batman and Spider-Man which were more popular among my peers. Bill Watterson’s comics were so engaging not only in their visual aspect, which was minimalistic yet powerful (and became a model for my own comics), but also in their stories. 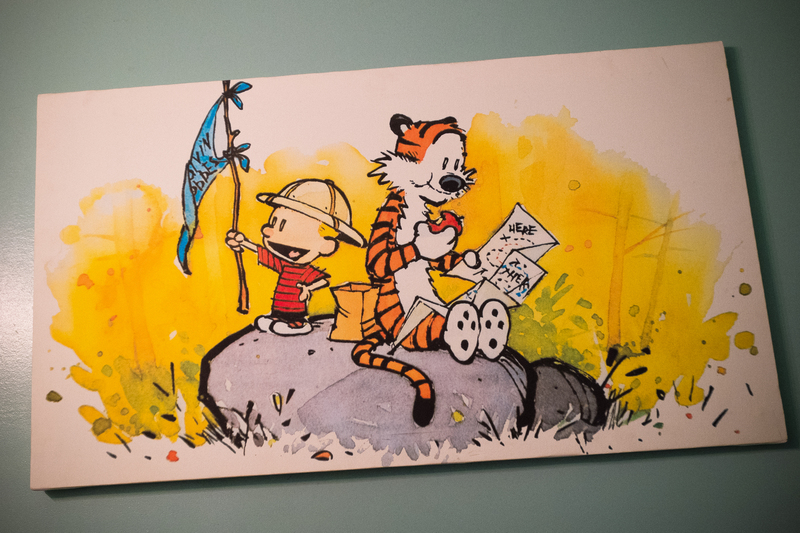 Watterson was able to breathe life through simple panels into characters that I could relate to, learn from, and love. Calvin represented to me a kid enjoying life to the fullest. His tenacity for adventure and imagination made me admire his ability to take the worst situations and put his own, unique spin to them. Whether that be assuming the persona of Spaceman Spiff to free himself of the alien that is Miss Wormwood or building a boys-only treehouse, Calvin’s ability to enjoy life seemed limitless (with homework being an exception). And for a six-year-old, Calvin was also very intellectual. In my childhood they seemed to be filler text, but reflecting now, many of Calvin’s monologues are profound, as they often present philosophical ideas of existence and the purpose of life, surprisingly. And so, Calvin could also represent the dichotomy of life. Through Calvin, Watterson wants us to reflect on the various concepts that Calvin brings up. Why do we exist? Is there a reason? Where will we be in the future? And yet, Watterson also wants to remind us life is limited and that there does not have to be an answer to these existential questions. Rather, we should step into the shoes of a six-year-old, where imagination roams free and the world is your playground. He is a rebellious six-year-old on the surface, but beneath, Calvin is deeper, a mirror to ourselves and a representation of the innocence of childhood.